Watch for tips on how to collaborate with fitness editors, media and influencers. . . When you need to get the word out about your new fitness class, gym, yoga studio or wellness workshop, the fastest way to connect with customers and clients is through influencers and media. Sign up for ThePRPlaybook.com for more real life lessons on how to build your fitness, health, wellness and nutrition startup. In this video I show you how to get started, how to find the writers, bloggers and journalists most likely to collaborate with you and report on your launch and how to connect via email and social media. It’s been just a few weeks and I have already connected the brand with The NY Daily News, Cosmopolitan Magazine, The NY Post, US News & World Report, Well & Good NYC and TimeOut NY. 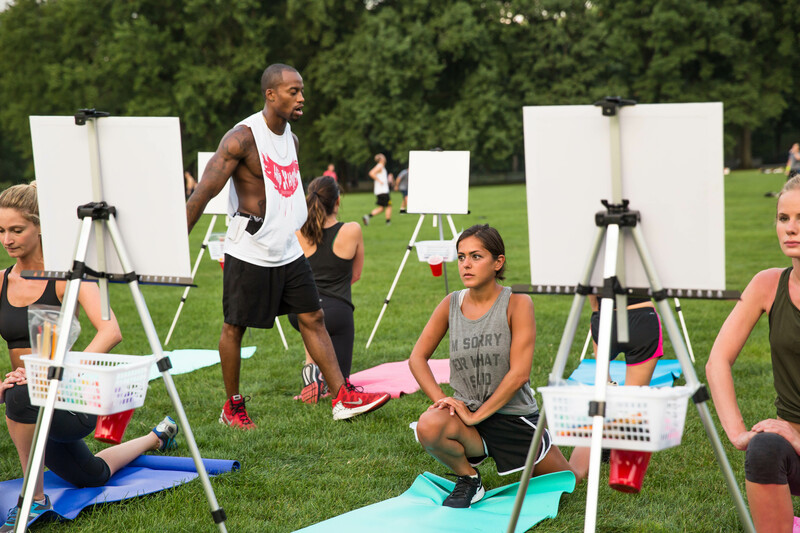 A new fitness experience in New York, created by artist and personal trainer, Sayco Williams, H.I.I.P. HYPE stands for High Intensity Interval Painting. Many exercise and fitness enthusiasts are familiar with high intensity interval training, where someone performs a given exercise for a short interval followed by a rest interval; it’s a very effective and very efficient means of training that can produce impressive results. H.I.I.P. HYPE puts a brand new spin on this popular style of training by incorporating acrylic painting on canvas into rest periods, allowing participants to express their creativity in a pressure-free group setting. No prior painting experience is required; many participants have never painted before. And while some brief and general instructions are given during the warm-up, the goal is unhindered expression; to flow with whatever comes out. The exercise portion is all done with bodyweight exercises, meaning minimal equipment requirements and participants of any fitness level can be happily accommodated. This combination of physical activity and creative stimulation leads to an amplified mind-body connection, and is a perfect remedy for the hyper-connected, permanently-stressed culture that permeates the world today. A study in the journal Frontiers in Human Neuroscience shows that regular exercisers do better on tests of creativity than their more sedentary peers. Everyone benefits from disconnecting on a regular basis, and taking a HH class is an exhilarating way to reap that benefit and get a great workout in as well. H.I.I.P Hype classes are also great for people who have become bored with their traditional fitness routine — it’s unlike any other fitness class out there. Previous How to Work with a PR Agency without Losing Your Mind.